The son of Seth Brundle comes of age. This movie opens roughly 9 months after the end of The Fly and proceeds from there over the course of five years. Although the character of Ronnie Quaife appears briefly in the film, original actress Geena Davis chose not to return for this sequel. Ronnie is portrayed by Saffron Henderson, an actress who bears a passing resemblance to Davis. This sequel to The Fly is generally not reviewed favorably, but I think it is underrated. Though it does not have the same intense pacing, suspense, and originality of the first film, it is well-acted by the leads and has three great scenes: when Martin learns that his dog is still alive; when the dog recognizes Martin and he puts the dog out of its misery; and when the now-deformed Bartok finds himself in the same conditions as the dog at the end of the film. The first two scenes mentioned get to me every time. The musical fanfare of the 20th Century Fox logo at the beginning of the film has been replaced with the sound of a fly buzzing. The buzzing continues as the screen fades to black and fades in on the headquarters building of Bartok Industries and the buzzing turns into the sound of helicopter rotors as CEO Anton Bartok is flown in. The helicopter that Bartok flies in on is an Aérospatiale SA 341 Gazelle. Bartok uses it again at 1:13:33 on the DVD. Aérospatiale was a French manufacturer of aircraft and rockets at the time. The shot of Ronnie Quaife giving birth at 0:48 on the DVD has been flipped, as evidenced by the reversed writing on the whiteboard in the background. A screen grab flipped horizontally so it is correct again shows one of the names on the whiteboard is Dr. Brooks; this is presumably a reference to executive producer Mel Brooks. The nurses assisting with the delivery of Ronnie's baby are wearing head caps that have silhouettes of butterflies on them. This may be a nod to one of the alternate closing scenes filmed for The Fly but not used, one in which Ronnie, after Seth Brundle's death, has a dream that her and Seth's baby is born with beautiful butterfly wings and flies away. At 1:10 on the DVD an IVAC pump is seen in the delivery room next to Ronnie's bed. IVAC is a brand of infusion pump, used to infuse medication or nutrients into the circulatory system of a patient. Ronnie gives birth to a sort of larval sac (known among some insects), from which soon emerges what seems to be an otherwise normal baby boy. The larval sac does not look much that of a housefly though. 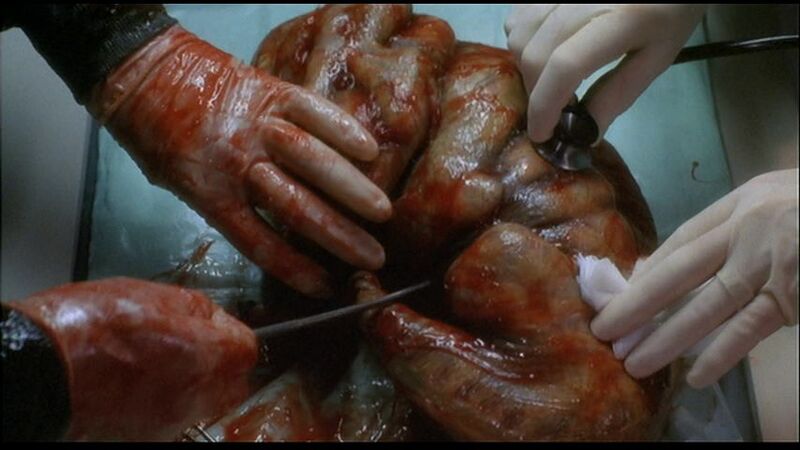 It looks somewhat like a gigantic version of an early-stage human embryo. Baby Martin experiences accelerated growth. At 6:44 on the DVD, notice that little Martin is leading Dr. Shepard around by his tie in his room! At 8:35 on the DVD, when Dr. Shepard holds up a maze on a piece of paper, notice that Martin draws the line for the maze's solution on a blank sheet of paper that lines up perfectly with the maze when Shepard overlaps the two sheets. Martin builds himself a piece of headgear that is basically just a sophisticated toy to play with. When he speaks through the mouthpiece on the headgear, his robotically-distorted voice is somewhat hard to understand. He says to Dr. Shepard, "People of Earth, attention. I grow tired of your trivial insolence. Another outburst and I will be forced to make an example of you." After Martin delivers the above message, Dr. Shepard asks him what else the helmet does and Martin shoots a stream of water in his face from a small aperture in the facepiece. This foreshadows the Martin Brundlefly shooting fly acid in the face of a security man in the last act of the film. At 10:04 on the DVD, we see that Dr. Shepard's first name is Norman from the computer screen that Martin types into. At 10:43 on the DVD, a man asleep at his console at Bartok Industries has the book The Shape of Rage: The Films of David Cronenberg in front of him. This is a 1983 book edited by Piers Handling. 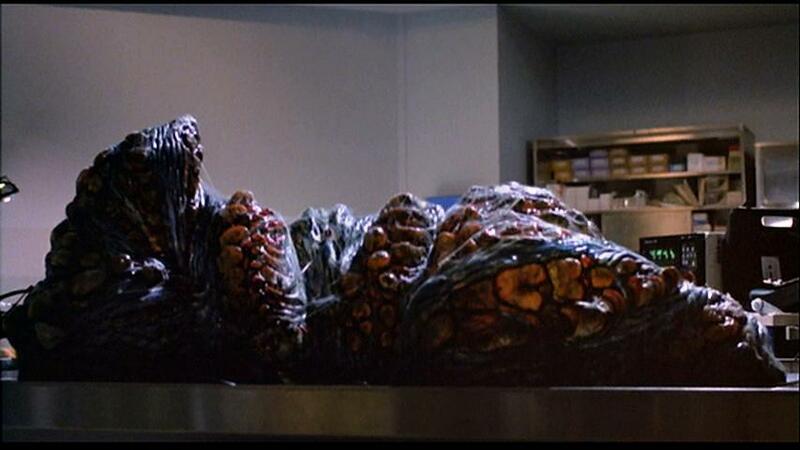 Cronenberg was the director of The Fly. At 11:57 on the DVD, a man wheels a cart loaded with an aquarium full of flies down the hallway in Zone 4 of Bartok Industries. Martin finds the aquarium and seems to have a fascination with the flies. At 12:34, the man notices a compact grouping of flies on the glass wall of the tank. It almost seems as if they have gathered into a rough pattern of a human head where Martin had been looking at them. At 12:26 on the DVD, we see that Bartok Industries has a room called the Insectary (a place where insects are kept, exhibited, and studied). 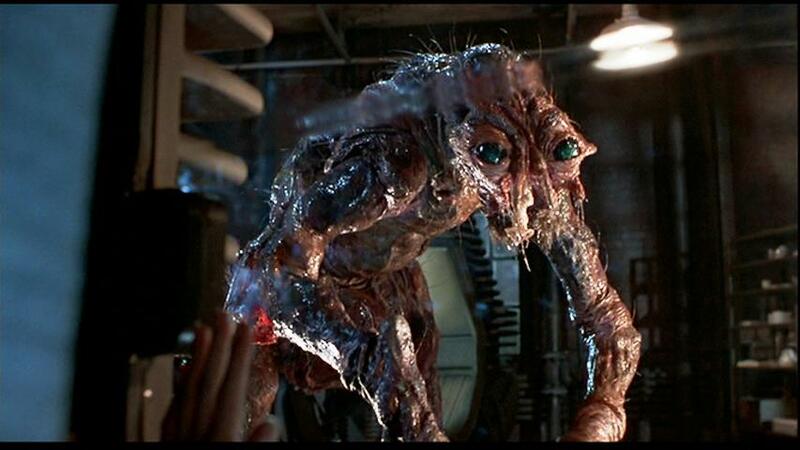 Does the insectary exist entirely because of the transformation of Seth Brundle in The Fly? The dog Martin befriends (known as Timex) may be a Golden Retriever. The Bartok scientists have told Martin that he suffers from a disease that only he and his father have ever had, calling it Brundle's Accelerated Growth Syndrome. As Martin walks past the dog cages at 15:08 on the DVD, one of the cages is marked "Observe" and another "Medication". The cage for the dog Martin has befriended is empty, with a tag reading "Transfer to Bay 17". Bay 17 is where we soon discover Bartok's new telepod experiments are taking place. At 16:57 on the DVD, as the computer scans the dog in the telepod, the computer screen labels the dog as Canine rectoris. Canine is the Latin word for dog, but rectoris is a genus of fish. Rectoris also may mean "leader" in Latin, so maybe it's just that the dog is the lead (or first) dog in the teleportation experiments. The computer screen seen here is a Sony monitor. Bartok Industries has built two new telepod prototypes for their experiments. Why does the sending pod have a mostly glass door and the receiving pod a metal door with no glass? It seems the door on the receiving pod is all metal simply for the dramatic effect of not being able to see how successfully the teleportation went until the door has been opened! At 18:22 on the DVD, the decorations on the birthday cake tell us that Martin is 5 years old, though he now has the body of a young man in his twenties. At 19:05 on the DVD, the shield-like label on the Champagne bottle Bartok hands to Martin to shatter the mirror that allows the scientists to observe him in his room indicates the Champagne is Dom Pérignon, one of the most prestigious Champagne brands in the world. When Martin is introduced to his own private quarters for the first time, notice he still responds very much like a kid, running around to touch everything and diving onto the bed with a "Whee!" Why is the Bartok team having such trouble with the telepods? 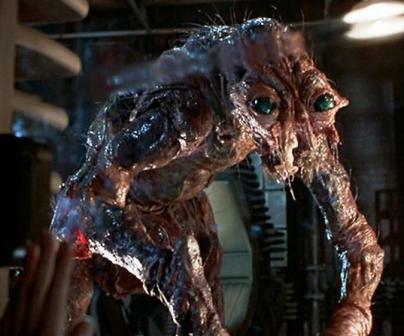 At the end of The Fly, Seth Brundle has them basically working, even for organic forms. It's not explained in this film other than a line from Bartok to Martin that "some of his secrets died with him." When Martin watches the video tapes recorded by his mother Ronnie of his father's work with the telepods, the video is footage that was deleted from The Fly. Ronnie's voice is dubbed by new actress Saffron Henderson, not Geena Davis' original voice. Although Henderson looks much like Davis, they do not have similar voices. At 25:14 on the DVD, Martin teleports an AT&T telephone. At 26:32 on the DVD a box branded with Honeywell is seen on top of a cabinet. Martin's catch of the fly lure at 26:54 on the DVD is a callback to his father's catch of a real fly in The Fly. Martin catches Beth practicing with a fly lure for fishing. Later, a framed photo of a fishing cottage on a wharf is seen on her desk at Bartok Industries. Much later, at 1:00:11 on the DVD, we see that the cottage is where she lives. In "Metamorphosis", Martin remarks on how his wife enjoys outdoorsy stuff like ice fishing and hunting. At 27:29 on the DVD, the sandwich on Beth's desk has tomatoes, lettuce, cucumbers, and cheese on it, but doesn't seem to have any meat. Is she a vegetarian? There is also an apple and a bottle of juice on her desk. At 30:27 on the DVD, Beth types something (four keystrokes) on Martin's computer keyboard before leaving his lab. What did she type and why? At 32:56 on the DVD, the song "Lock, Stock and Teardrops" as performed by k.d. lang is heard. At the Bartok Industries employee party Martin attends with Beth, a man says that the deformed dog (Martin's semi-pet) is called Timex because he "...takes a licking, keeps on ticking." Timex is a manufacturer of watches and clocks. "It takes a licking and keeps on ticking," is a slogan used by the Timex brand, mostly in the 1970s and '80s. The "Timex" scene reveals in dialog that the teleportation experiment with Martin's dog took place about 2 years ago. The chemical that Martin uses to euthanize Timex is not revealed; he pours a liquid amount of it onto a cloth and holds it against the dog's nose and mouth. It may be cyanide. At 43:34 on the DVD, notice that Martin has Beth's deformed (teleported) cactus on his desk. It seems to still be living (as the dog did) despite its teleporter-induced deformity. During Martin and Beth's love scene at 46:05 on the DVD, the book The Growth of Biological Thought is seen off to the side of Martin's bed. This is a 1982 book by Ernst Mayr (1904-2005) about biology and the role of philosophy in science. Beth must like cacti. Besides the one she had at work, we also see several at her home at 50:36 on the DVD. When Beth tries to call Martin at Bartok Industries and asks to speak to Martin Brundle, the receptionist on the line says, "I'm sorry, there's no Martin Brundle working here. Please try again later." If the receptionist is claiming there's no Martin Brundle working there, why would she say to try again later? At 52:59 on the DVD, notice that Martin is able to knock down the entire door to the spy room with one kick, an indication of his strength increasing as the metamorphosis begins. After breaking into the spy room, Martin watches some video clips of his past at the lab and also finds video of his father explaining to his mother that a fly must have got into the transmitter pod with him the first time and the pods spliced their DNA together. 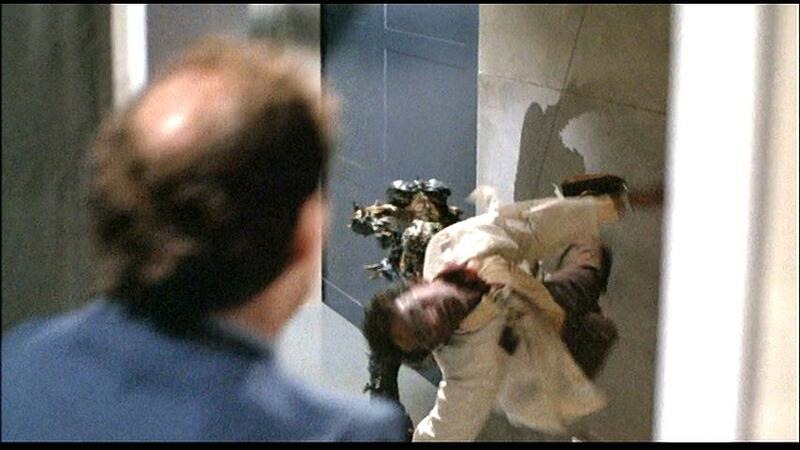 This footage is from The Fly, but their was no video camera recording this particular scene between the two in the film! As Martin grows enraged at Scorby's remarks about Beth at 57:52 on the DVD, notice that a sound similar to a fly buzzing is heard over the soundtrack. The bespectacled man who plays a Bartok technician at 58:45 on the DVD is actor Bruce Harwood, who would go on to play John Byers, one of the Lone Gunmen, on the X-Files TV series. 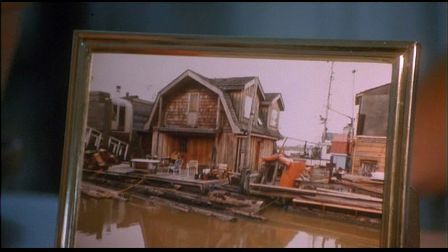 At 1:00:14 on the DVD, Martin arrives at the wharf looking for Beth and finds a sign indicating which cottage the five residents of the wharf are in. Beth is number 3. Number 1 is G. Pearson, named for the assistant art director of the film, Glen Pearson. Number 4 is J. Moore, named for art department trainee Jennifer Moore. Number 5 is S. Cochrane, named for art director Sandy Cochrane. 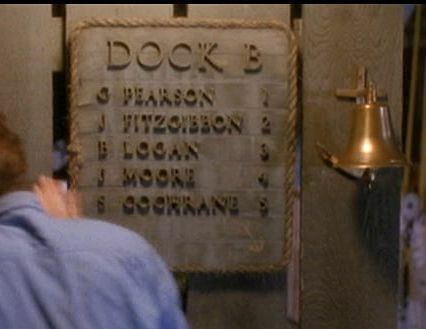 That leaves number 2, J. Fitzgibbon, unaccounted for; I don't know who that might refer to. At 1:00:38 on the DVD, a can of Pepsi is seen on an end table in Beth's cottage. A Pepsi vending machine is seen at a motel later in the film; possibly Pepsi was a sponsor of the film. The Bartok van seen at 1:02:04 on the DVD is a 1985 Chevrolet Astro. Beth's car seen at 1:03:06 is a 1973 Chevrolet Nova. It has license plate number 244 F35, but the state or province on it is not readable. After Martin and Beth invite themselves into Stathis' house, notice that Stathis pours himself a drink but doesn't offer them one! Stathis' living room walls are practically lined with bookshelves full of books and even more books are stacked on the floor and tables. Stathis' version of how Seth Brundle met his death is slightly altered from the events seen in The Fly, most likely due to faulty memory or in an effort on his part to make Brundle sound weaker out of spite (or both). Stathis' car (which he refers to as a Jeep, though it's not) which he loans to Beth and Martin is a 1978 Chevrolet Blazer. After leaving Stathis' home, Beth and Martin stay at the Rest Easy Motel. Although there are a number of motels in the U.S. and Canada by this name, this one is probably fictitious. At 1:08:55 on the DVD, a sign on the office door indicates the motel was AAA recommended in 1988; AAA is the American Automobile Association. There is a sticker on the motel office door that reads "Stamp Out the Bug". I don't know what that is referring to. A clock in the motel office shows that it is about 10:20 p.m. when Beth checks in there with Martin. An American Express credit card machine is seen sitting on the motel check-in desk. Beth checks in with the last name Smith to cover her identity. It's not revealed what first name she used. The tractor trailer truck that nearly runs Martin over appears to be a Kenworth W-900. At 1:10:58 on the DVD, Martin sits in the motel room and watches the light of a bug zapper outside the window. He says, "How beautiful that light is. How...compelling." This suggests how he is attracted to the light just as many insects are. Martin's transformation into a humanoid fly creature is different from the one experienced by his father in The Fly. 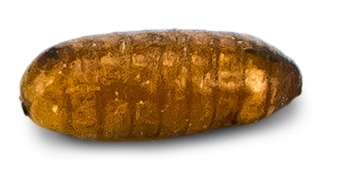 The stages look different and he even goes into a pupa stage before emerging from a chrysalis. The chrysalis stage he goes through does not look at all like an actual fly pupa. The metamorphosis also proceeds much more quickly, in only a few days, as opposed to several weeks. When Bartok flies to the motel in his corporate helicopter to pick up Martin and Beth, another (possibly medical chopper) has already arrived. This second helicopter appears to be an Aérospatiale AS355 TwinStar. At 1:19:16 on the DVD, we see that Martin's pupa is connected to a Datascope 2100 patient monitor. After Martin emerges from his pupa, Scorby and the other security personnel at Bartok headquarters arm themselves with modified Heckler & Koch HK94A3 submachine guns. 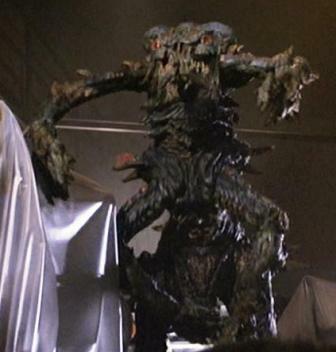 The Martin Brundlefly looks different than the Seth Brundlefly. Martin Brundlefly also has six limbs, like an actual insect, instead of just four like Seth Brundlefly. To me, the creature almost looks more like an ant than a fly. The dog used by the security personnel appears to be a Rottweiler. The dog first barks at, then briefly appears frightened of, then befriends the Brundlefly. Martin's affection for dogs seems to have followed even into his Brundlefly metamorphosis, an almost immediate suggestion that some of Martin still exists in the creature. When the Brundlefly throws Dr. Shepard's body at the security man at 1:26:50 on the DVD, a wire can be seen attached to the body to propel it. The Bartok security personnel are seen to use Motorola walkie-talkies. 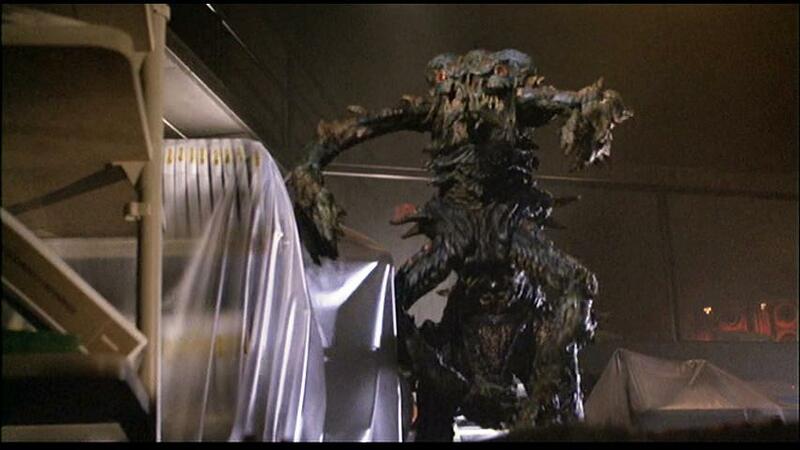 Brundlefly takes down the security man named Mackenzie by squirting corrosive fly vomit in his face. The man clutches and scratches at his face in agony as the skin melts and he winds up pulling off his own face! When other security personnel arrive and find the downed man just a minute later, notice he is still breathing and the lead man calls for a medical emergency team. Poor Mackenzie is going to be hating life, assuming he survived in the long term! At 1:29:44 on the DVD, Brundlefly rips apart some kind of electrical junction box or some such contraption called an ESC-50 by Energrated Systems, taking down the main power for the building Bartok is in. As far as I can tell, this is a fictitious company. After crashing down through the glass of the observation room above Bay 17, the Brundlefly appears to emit a blast of water or other clear liquid from a hump-like structure on its back at 1:30:21 on the DVD (it's almost unnoticeable, but definitely there). I'm not sure what this is supposed to be. 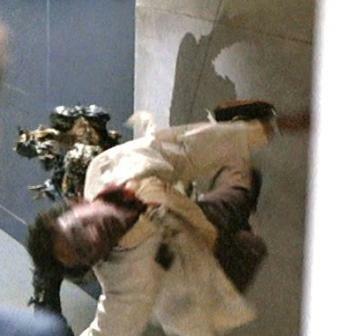 After Scorby is killed by Brundlefly, Bartok takes a Desert Eagle Mark VII pistol from the man's body to use, ineffectually, against the beast. When Beth tries to wrest the pistol from Bartok, it seems that Bartok does have at least a shred of decency in him when he grabs the tazer off Scorby's belt to knock her out rather than just shooting her with the gun as he could have. The password that Martin programmed into the telepod system turns out to be, simply, "DAD". After the teleportation sequence that mixes the genetic code of Martin Brundlefly and Bartok, Martin seems to be "fully" human again and Bartok appears to be a merge of himself and the Brundlefly creature. In a horrifying twist at the end of the film, the deformed Bartok is seen being treated in the same manner he had treated Martin's deformed dog earlier in the film. This also gives the impression that Martin may now be in charge of Bartok Industries and has condemned Anton Bartok to this fate (Martin's position at Bartok Industries seems to be confimred in "The Book of Transgenesis"). The end credits of the film have the acknowledgment, "Based on characters created by George Langelaan". Langelaan wrote the original 1957 short story "The Fly". When the telepods merged Martin Brundlefly and Bartok, what happened to Bartok's clothing? Martin was already naked as the Brundlefly, but Bartok was wearing a business suit. Yet, when they materialize in the receiving telepod, neither transformed body has clothing.